Simcha is not an easy task, but on Sukkos we must rise to the occasion. The Orchos Tzaddikim gives us clear guidelines on the Positive and Negative of Simcha. 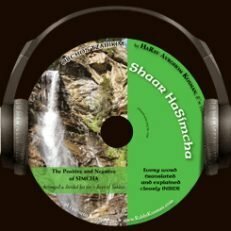 SHAAR HASIMCHA (1 hour 46 min) from Orchos Tzaddikim is a wonderful way of getting Simcha “down pat”.